Jim Sanders at Hidden Genealogy Nuggets website and blog has created the Genealogy by the States blogging prompt, suggesting each week we blog about an ancestor or one of our families that have a connection to that state. 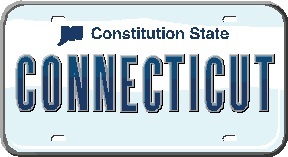 This week's state is Connecticut. Connecticut was home to a few of my ancestors. I have traced my Glover ancestry back to the early 1700's when Thomas Glover, son of Henry Glover and Mary Crehore was born on 8 January 1719 in Lebanon, Connecticut, British America. Thomas Glover married Joan Swift on 10 February 1743 in Lebanon. Thomas and Joan's son, Alexander Glover, my fourth great grandfather, was born on 20 March 1756 in Lebanon. The Glover family left Connecticut sometime before 1780. Another Connecticut family was the Powers family. I need to do more research on this line, but Jonas Powers married Mary Tryon on 12 April 1739 in Middletown, Connecticut, British America. Their son, David Powers was born 2 February 1747 in Middletown. The Powers family migrated to New Hampshire before 1768. I have found Connecticut to be a great place to find records for. Here are a few of the resources I use in my research. Do you have a favorite Connecticut research source? Share yours by leaving a comment. Brenda, I'm delighted to learn you have Connecticut Ancestry, so maybe here is our chance to find a connection. Thanks for your useful listing of sources for my birth state. Barbara, many of my Massachusetts ancestors seemed to have traveled on their way to Vermont and New York through Connecticut. I have a couple of brick walls with these lines. Maybe someday we will connect lines! Dear Jana, thank you for the mention. I enjoy checking your Fab Finds out and have found a few new blogs to follow.